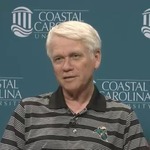 Parker, a Coastal alumnus, served as a CCU Board member from 1993 - 2008 including two terms as Chair. He discusses his years as a student at Coastal, meeting his wife, Marcia (a Coastal student) and their campus jobs in athletics. He recounts his statewide work with many others for Coastal's independence from USC, its hurdles and challenges. Parker is an honorary founder of CCU. The second campus building carries his and his wife's names, the Clark and Marcia Parker Atheneum Hall Alumni Center in 2017. Funded in part by the Horry County Higher Education Commission. Copyright © Coastal Carolina University. For more information contact University Archives at Coastal Carolina University, Conway, SC 29526. Parker, Clark B. and Tomczyk, Charmaine B., "Clark B. Parker, oral history interview" (2016). The Coastal Carolina University Oral History Project. 4.